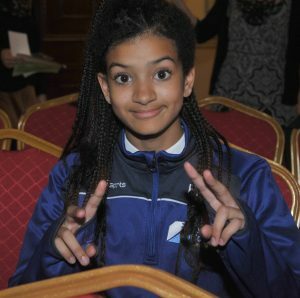 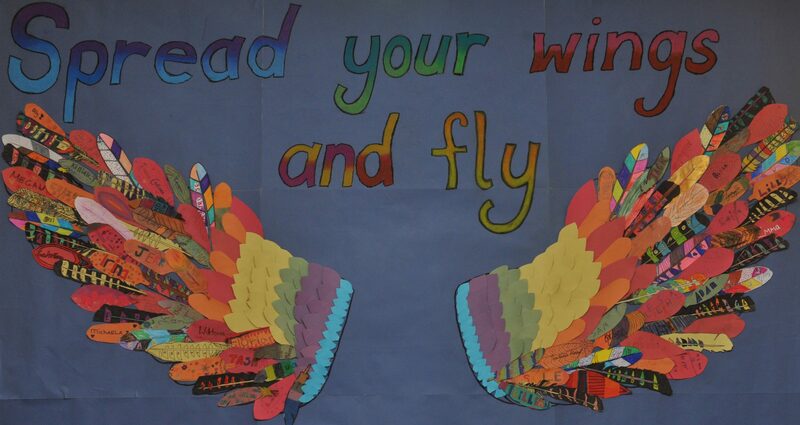 By Isabelle Manuel Moten and Fahima Islam Mily, 1 Eagle. 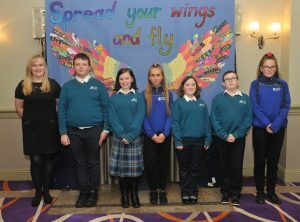 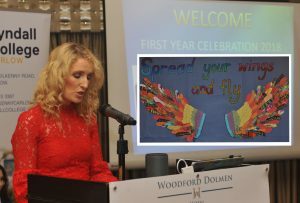 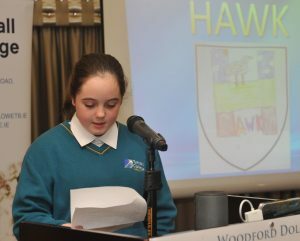 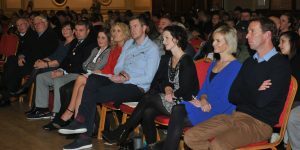 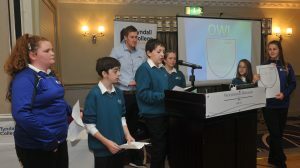 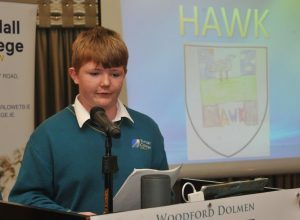 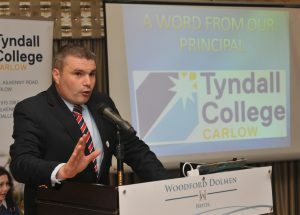 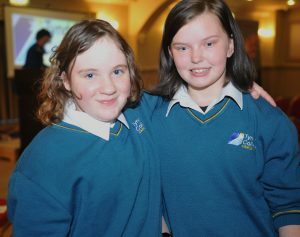 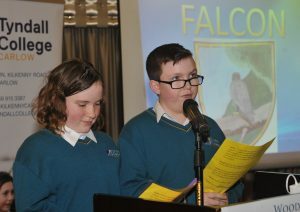 On Monday 22nd October all First Year students along with our teachers, families and friends gathered in the Woodford Dolmen Hotel for our First Year Celebration. 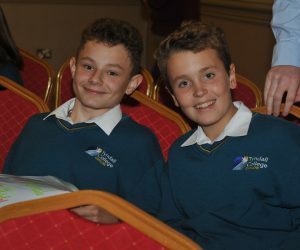 The evening was an opportunity for us to showcase what we have been doing since the start of the school year and celebrate our achievements so far. 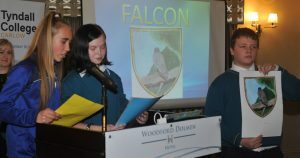 The five classes – Eagle, Hawk, Kestrel, Owl and Falcon – each prepared something special for the night. 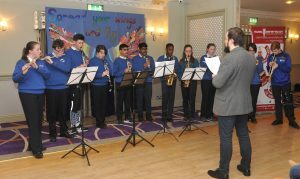 The evening kicked off with an amazing performance by members of BoomBrasstic, the Music Generation Wind and Bass group that is based in our school. 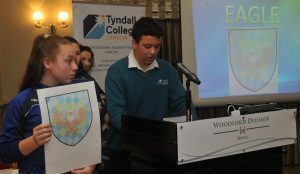 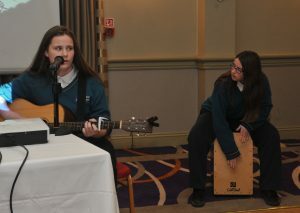 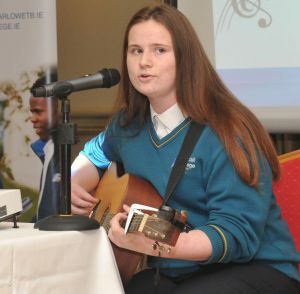 All Second to Sixth Year Tyndall College students who get Music Generation lessons in school are members of this group. 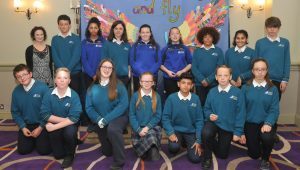 Students from each class group spoke about their first impressions of the school and what they have enjoyed the most over the past few weeks. 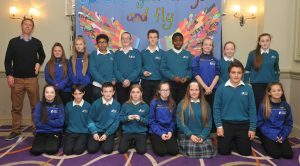 We also spoke about the strong and courageous qualities of our class birds and how we will try our best to show these qualities every day. 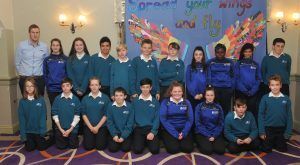 Fantastic class logos designed by students were also unveiled during the Celebration and these logos will represent our groups from now on. 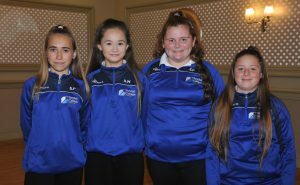 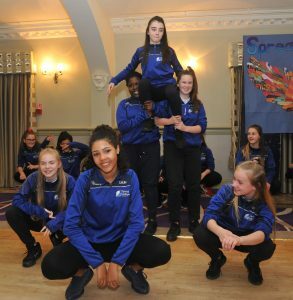 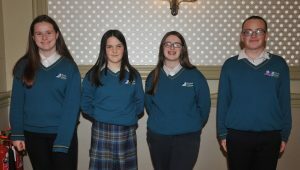 Entertainment was provided by a First Year hip-hop group under the expert guidance of Ms. Kinchella and a breath-taking performance of Counting Stars by Caitriona Kinsella and Lilly-Mae O’Brien. 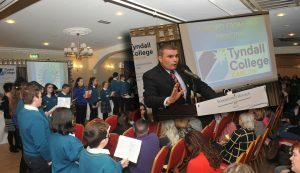 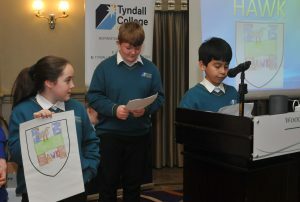 Inspiring words were spoken by our Year Head Ms. Howard-Bowles and Principal Mr. McGill during the evening and we were each presented with a Tyndall College badge that we will wear with pride. 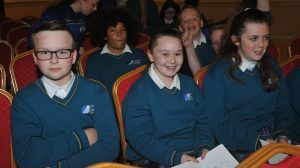 Ms. Lawlor our guidance counsellor spoke to our parents and guardians about the Letter for Graduation she had asked each of us to write to ourselves during our first week in secondary school. 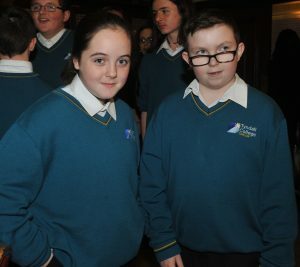 These letters will be kept under lock and key and given back to us at our Sixth Year graduation in 2023 or 2024! 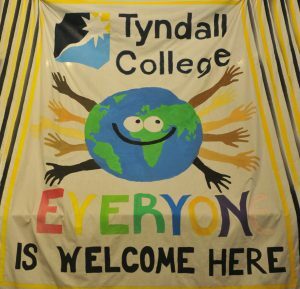 Then we were all very excited when Ms. Morrissey surprised us with a video called A Day in the Life of a Tyndall College First Year Student. 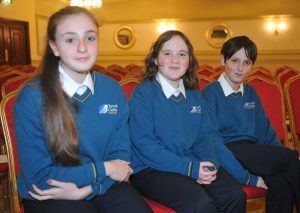 It was great seeing ourselves on the big screen! 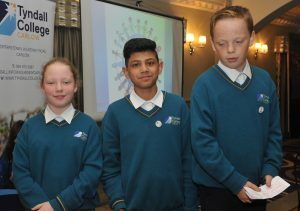 The final part of the night celebrated the many different nationalities represented in our year group and how diverse we are. 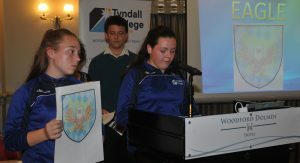 Every single First Year student stood and held the flag of where they were born or where they had lived and we all sang This Is Me as our final song. 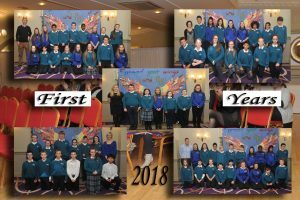 We all enjoyed the Celebration very much and are very grateful to our Year Head Ms. Howard-Bowles and Tutors Ms. Phelan, Ms. Tyrrell, Mr. Manton, Mr. Doyle and Ms. Ni Fhaoláin for helping us prepare. 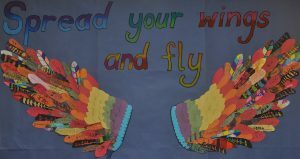 A big thank you also to our art teacher Ms. Kassam for designing the incredible Spread Your Wings and Fly display where we each attached a feather representing our class birds decorated with our name. 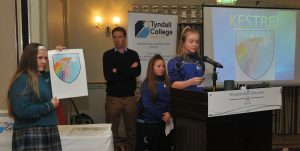 It has been a very busy and enjoyable first few weeks in Tyndall College and we can’t wait to see what the future holds!